While everyone frets about rising mortgage rates, down payments continue to be the biggest hurdle to homeownership. 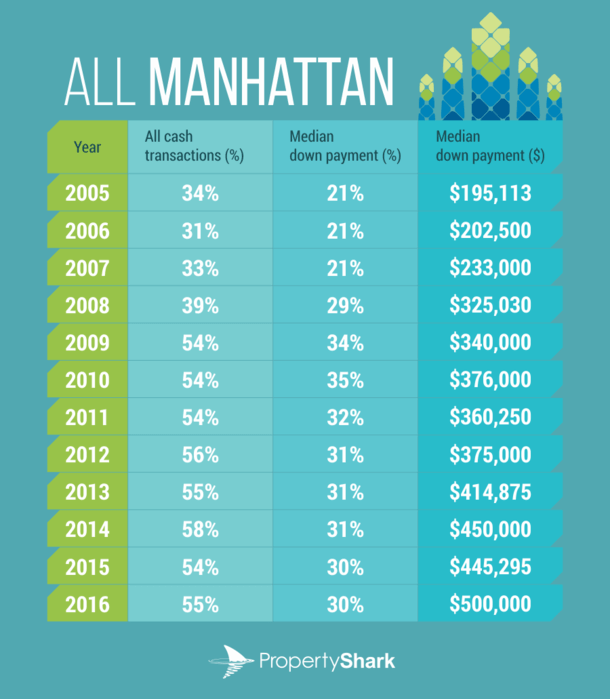 This couldn’t be more true in Manhattan, where the median down payment increased to a staggering $500,000 this year, according to a new report from PropertyShark. The company noted that the required down payment is roughly $200,000 more than the total cost of the typical American home. 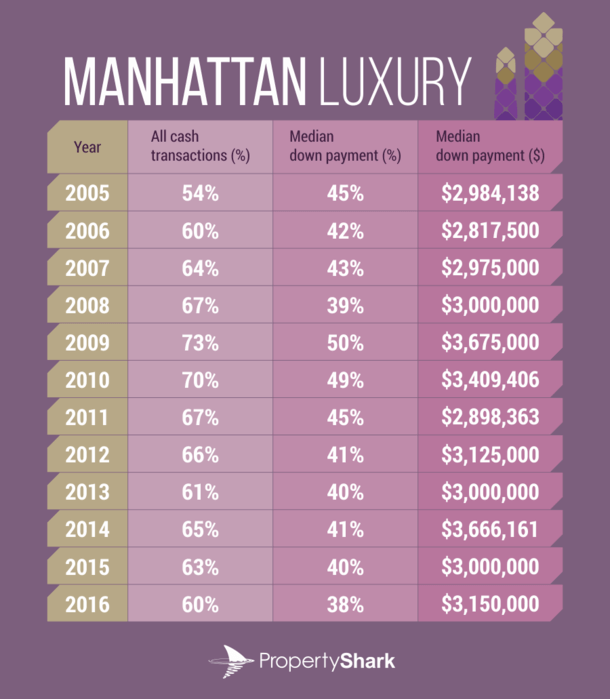 Over the past 10 years, the median down payment in Manhattan has risen by “no less than $267,000” thanks to massive home price increases in the city. During that same time, the median U.S. home price climbed $59,000 to $301,000 as of the most recent quarter. Back in 2005, the median down payment in NYC’s most expensive borough was just $195,113 and the median down payment then was 21%. It then surged higher despite the economic downturn and housing crisis to half a million dollars this year, with the all-cash share hitting 55% of sales. The good news is the down payment issue has only been a hurdle for less than half of home buyers in the city. 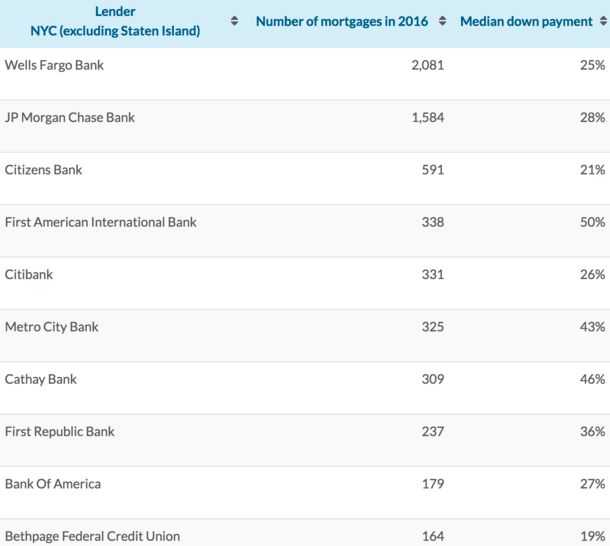 In the Bronx, the median down payment was a much more favorable $79,000…although still sizable when compared to just about any other city in the country. If you thought $500,000 was a large down payment, consider the fact that the down payment for so-called luxury real estate ($5 million and up) was $3,150,000 this year in Manhattan. That’s only up marginally from the median down payment of $2,984,138 back in 2005, and well below the $3,666,161 in 2014. However, the median down payment as a percentage was just 38% this year, down from 45% in 2005. Apparently more lenders are willing to take on super jumbo loans. In nearby Brooklyn, the median down payment was $226,000 this year, with buyers generally putting down 25% toward their home purchase. It too has risen dramatically, from just $82,500 back in 2005. But back then it was more common to put down just 20%. Things aren’t much easier in Queens, where the typical buyer must come in with $187,660 to muster a 27% down payment. Unsurprisingly, Wells Fargo was the largest mortgage provider in NYC this year, doling out 2,081 home-purchase mortgages to city residents through early December. They were followed by Chase with 1,584 mortgages and Citizens Bank with 591. First American International Bank (338) and Citibank (331) rounded out the top five. 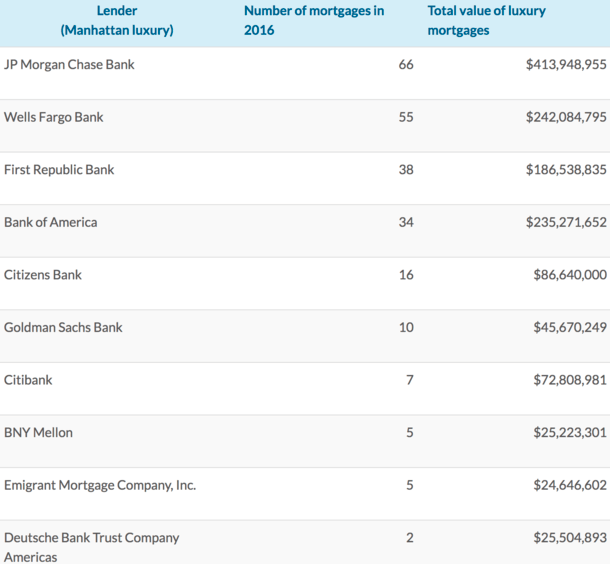 Meanwhile, Chase financed 66 luxury home purchases in 2016 – those above $5M, totaling nearly $414 million in loans. Wells Fargo came in a distant second with 55 purchase loans totaling $242 million, followed by First Republic Bank with 38 loans totaling nearly $187 million. Bank of America did fewer loans (34) but the aggregate loan balance was a much higher $235 million, and Citizens Bank was fifth with 16 loans totaling about $87 million. Overall, 63% of home sales in NYC relied on the use of a mortgage this year, with a median down payment of $224,750, or 26%. For these folks, higher mortgage rates probably sting pretty bad.